I learned how to make shortbread cookies when I decided to add them to my Christmas recipes. When I was a young wife and mother I had so many tell me they loved shortbread cookies. After only a few years of Christmas cookie making I decided I needed to add a few of these favored recipes to my collection. 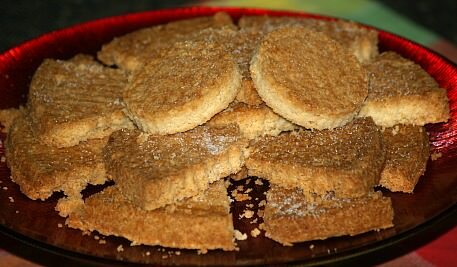 Good shortbread cookies should have a sandy-like texture (a little crumbly) with a rich buttery flavor. After baking you will have sweet crisp cookies, perfect for coffee or tea. Although you will find these cookies popular in many countries of the world history takes us to Scotland. One of the first known recipes appearing in print on the seventeen hundreds. The very first recipes called for the adding of yeast but was later dropped from the cookie recipes. As I learned how to make shortbread cookies I found many still use the base of original recipes. Traditionally, bakers use a simple ratio for making shortbread cookies; 1 part sugar, 2 parts butter (NO SUBSTITUTE) and 3 parts flour. This ratio or close will result in a tender crisp crust. Although butter, flour and sugar are still the primary ingredients, the ratio may be different. Also, you may find other ingredients such as flavorings, chocolate and jam added to the recipes. This is why we have so many different recipes for shortbread cookies today. If you are learning how to make shortbread cookies, traditionally the butter would be firm but not hard and cut into small pieces (About ¼ to ½ inch cubes). The butter is then cut into the flour and sugar mixture until crumbly. At this time some type of flavoring is added if desired. The dough is then pressed in a pan (Usually a special shortbread pan) to bake. Today, you will want to follow your recipe closely because over the years the process and baking pans have often been changed. Since I first learned how to make shortbread cookies I have collected so many great recipes. They are no longer just a plain simple (Still delicious) tea cookie but ones with so many variations. Still having the rich buttery flavor, other ingredients added make cookies to please all taste buds. Even the designs of the cookies have been expanded. They can be baked in many types of pans and even cut out with cookie cutters. When you learn how to make shortbread cookies you will notice most recipes will tell you to bake them in a slower oven; 300F degrees to 325F degrees. Learn how to make shortbread cookies with cake mix. In a large bowl combine cake mix, nuts, butter and egg; mix on low speed to crumbly. Press mixture in bottom of prepared pan; spread with the preserves. Bake 25 minutes or until edges are golden brown. Combine sugar, water and almond extract; mix until smooth. 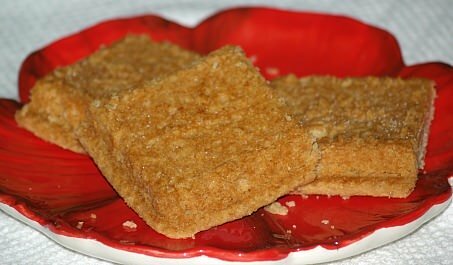 Drizzle over warm shortbread; cool completely and cut into squares. TO MAKE BASE cream butter and sugar together until light. Sift together flour, cornstarch and baking powder; beat into creamed mixture. Spread base in 9X13 inch baking pan and smooth top; bake 20 minutes until golden brown. Cool 10 minutes; make caramel. TO MAKE CARAMEL combine sugar, butter, corn syrup and canned milk in heavy saucepan. Cook over medium low heat until butter melts and sugar is completely dissolved. Bring mixture to a boil; cook about 23 minutes (to 237F degrees) stirring constantly (Watch carefully). Remove from heat; stir in vanilla and continue stirring 2-3 minutes to cool slightly. Pour over shortbread layer; let to cool completely. 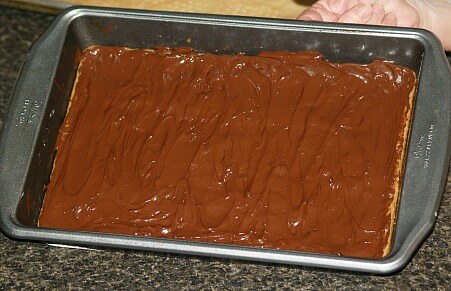 FOR TOP LAYER melt chocolate; pour over the caramel layer. Move pan from side to side to completely cover area. Let set to cool; cut in squares with sharp knife. Learn how to make shortbread cookies with rosemary. Combine flour, butter, powdered sugar and rosemary in processor. With knife blade, process until mixture forms a ball. Roll dough on a lightly floured surface to ¼ inch thickness. Cut with a 2 inch cookie cutter; place on a lightly greased baking sheet. Bake 18 to 20 minutes until edges are lightly browned. Sprinkle cookies with sugar; move to wire rack to cool completely. Learn how to make shortbread cookies with this quick and easy recipe. Cream butter and sugar thoroughly; add flour one cup at a time mixing well after each addition. NOTE: Mixture will be stiff and crumbly. Knead dough gently until well blended; press dough into ungreased 10X14 inch jelly roll pan. 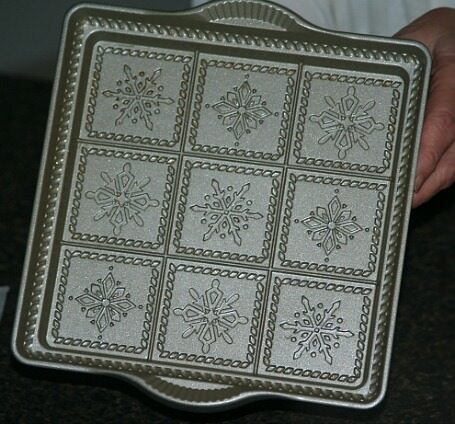 Using spatula, level top; imprint in rows with cookie stamp to form designs or prick top with fork. Bake 30 to 35 minutes; remove from oven and immediately cut into squares. Remove from pan with spatula to a rack to cool; makes 35 two inch squares. 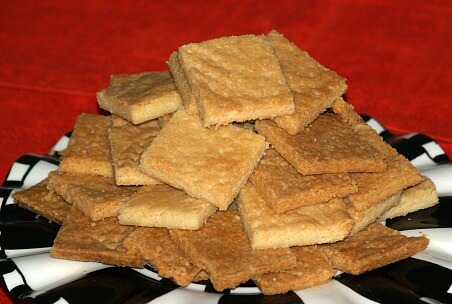 You can learn how to make shortbread cookies with a wonderful spiced flavor using this recipe. Combine flour, brown sugar, cinnamon, ginger and cloves in a large mixing bowl. Cut in butter until mixture is fine crumbs and starts to cling together; knead into a smooth ball. On an ungreased baking sheet shape dough into 8 inch circle; press a scalloped edge. 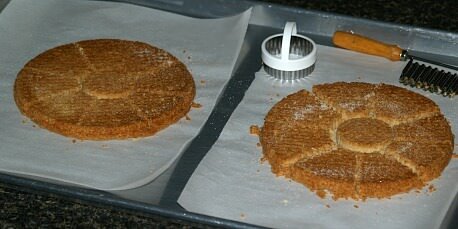 Using a thin knife cut circle into 16 “pie shape” wedges; DO NOT SEPARATE. Bake 25 to 30 minutes until center is set and bottom begins to brown. Cut circle into the wedges again while hot; lift wedges to a rack to cool. Sprinkle cooled cookies with sifted powdered sugar; makes 16 cookies. 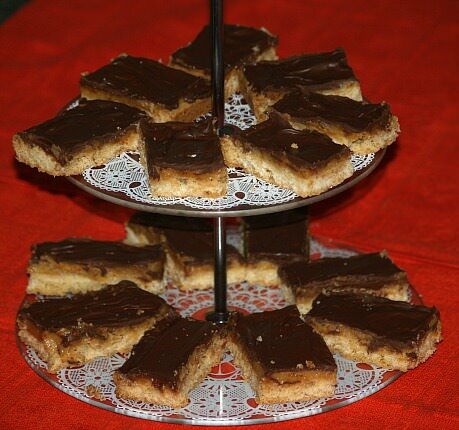 Learn how to make shortbread cookies with this chocolate topped Scottish recipe. Preheat oven to 325F degrees; grease 8 inch square cake pan, line with wax paper and grease paper. TO MAKE SHORTBREAD beat butter and sugar until light and fluffy. Stir ground almonds and mixed fruit into creamed mixture. Stir in flour to make a soft dough; knead dough in the bowl until smooth. Press dough into prepared pan and smooth top; bake 30 to 35 minutes until golden. Cool 10 minutes in pan; turn out of pan and remove paper lining. Cool completely on rack; return shortbread back to pan. TO MAKE INCING combine butter, milk and granulated in a small saucepan. Over low heat cook stirring until butter melts; bring mixture to a boil and remove from heat. Sift cocoa and powdered sugar into a bowl; beat in hot milk mixture until icing is stiff and completely cooled. Spread icing over the shortbread in pan; make wavy lines in icing with prongs of fork. 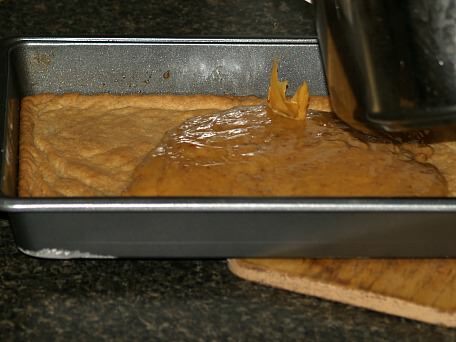 Let stand until icing is set; cut into squares and remove from pan. Makes about 16. In large bowl combine almonds, flour, powdered sugar and coffee until blended. Add butter; beat on medium speed until blended scraping down sides of bowl. Shape dough into a ball; wrap in plastic wrap and refrigerate 30 minutes. Roll dough out on lightly floured surface to ¼ inch thickness. Cut dough with 1 ½ to 2 inch cookie cutter; place 1 inch apart on ungreased cookie sheets. Sprinkle cookies with granulated sugar; bake 10 to 12 minutes until edges are just firm. Move to rack to cool completely; makes about 60 cookies. Learn how to make shortbread cookies with this chocolate dipped almond cookie recipe. Beat butter in a large bowl with mixer until creamy; beat in powdered sugar until smooth. Sift together flour and salt in medium bowl; beat flour mixture into creamed mixture until blended. Add ½ CUP almonds and nutmeg mixing to combine; shape dough into disk and wrap with plastic wrap. Chill at least 1 hour; PREHEAT OVEN TO 350F degrees. Roll dough to ¼ inch thickness on lightly floured surface. Cut with rectangular cookie cutter; place on prepared baking sheets. Refrigerate on pans 10 to 15 minutes; bake 8 to 10 minutes until light golden. Move cookies to wire rack to cool completely; dip one end of cookies in melted chocolate. Place on wire rack; sprinkle with remaining ground almonds. Makes about 24 cookies. Combine flour, sugar and poppy seeds in a bowl; cut in butter until mixture is crumbly and starts to cling. Stir in lemon peel; shape mixture in a ball and knead until smooth. 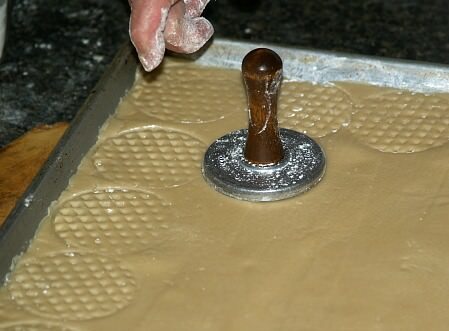 Roll or pat dough on lightly floured surface to ½ inch thickness; cut with 2 inch scalloped cookie cutter. Place cookies on ungreased cookie sheets 1 inch apart; bake 20 to 25 minutes until bottoms start to brown. Move cookies to rack to cool completely; brush cookies with lemon glaze (below). TO MAKE LEMON GLAZE combine and beat 1 cup sifted powdered sugar and 1 teaspoon lemon juice with enough milk to make glaze consistency (about 1 ½ tablespoons). 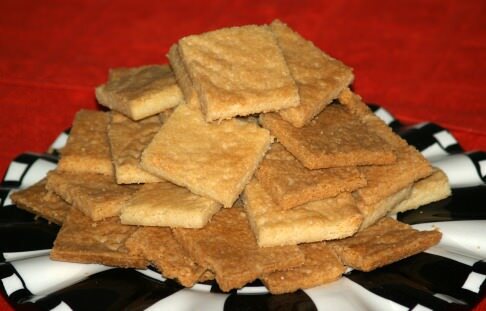 Learn how to make shortbread cookies with an English recipe. Preheat oven to 275-300F degrees; lightly grease and flour two 7 inch round cake pans. Combine and mix all ingredients with electric mixer; divide mixture in half. Spread in 2 prepared pans; bake 50 to 60 minutes until set NOT BROWN. While still hot cut circle in middle with round cutter or glass; cut 8 equal wedges around the circle. 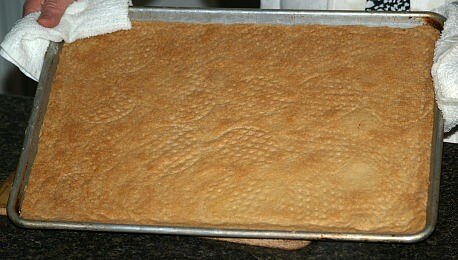 Shake powdered sugar or castor sugar over shortbread; allow to cool in pans. Cream butter and sugar on medium speed until light and fluffy; beat in vanilla and espresso. On low speed add flour mixing only to combine; by hand fold in chocolate chips. With a rubber spatula scrape “sticky” dough into a ONE GALLON freezer bag. With top opened roll dough in bag to a rectangle 9X 10 ½ inches and ¼ inch thickness. Seal zip lock bag and refrigerate at least 1 hour. Place dough in bag on cutting board; cut around the edges. Turn dough out onto cutting board and discard bag; cut into 1 ½ inch squares. 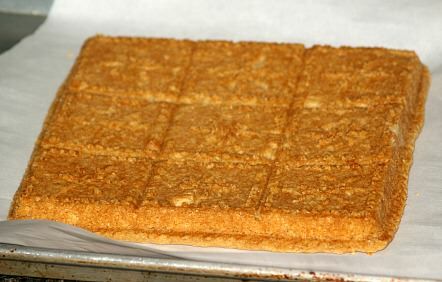 Transfer squares to ungreased baking sheet; prick each cookie 2 times with tines of fork. Bake 18 to 20 minutes until cookies are light golden; transfer to rack to cool. OPTIONAL: Dust with sifted powdered sugar. Learn how to make shortbread cookies with this Scottish recipe. Preheat oven to 325F degrees; line 7 inch round pan with parchment paper. Combine and mix flour, butter and sugar with fingers until consistency of bread crumbs. Press into prepared pan with back of spoon until top is smooth. Press all around edges with fork; prick all over top with tines of fork. Bake 30 to 40 minutes until golden; take out of pan carefully. Remove paper lining; cut in 1- to 12 wedges with sharp knife. Sprinkle top lightly with sugar; cool completely.